We hope you have been saving up those paper rolls as today we are sharing a whole bunch of incredibly fun ideas for toilet paper roll crafts. You’ll find a project for pretty much everyone, from magical fairies that are ready to fly to dragons ready to breathe fire. What will your kids be making first? Got a birthday coming up in your home? 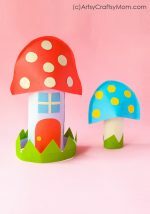 Make it one they’ll never forget by building up to the great day with these paper roll fairies from Kids Activities Blog. Not only do the fairies look absolutely gorgeous, they also contain hidden surprises inside! Now this is one fun birthday! Gifting is something everyone does, but the packaging can make this process a unique one! These cat gift boxes from Red Ted Art are super easy and super adorable – check out the detailing on the back! You can customize the cats any way you like to make your own personalized gift boxes. How would you like a friendly little octopus sitting on your table as you work? With a toilet roll and instructions from Easy Peasy and Fun, you can go ahead and make a smiley little ocean creature. The paper-curling might be difficult for young kids, so adult help may be needed. If you thought the Star Wars craze had died down, think again! For a true blue Star Wars fan, the force is always alive and kicking! This craft from Hello Wonderful is the perfect craft for such a fan, making use of a collage technique where pieces of paper are glued on to create the characters. Who doesn’t love Dr. Seuss? It’s quite likely that your Seuss fan has read the book about Horton or even seen the movie, which makes this craft perfect for him to make! Kids will have fun making the elephant’s trunk and Horton’s clover – the devil is in the details! This craft from Kifli es Levendula is perfect for when you have playdates over – boys or girls! Gather a bunch of toilet rolls, paints and cardboard, and let the kids create their own custom race cars! Increase the play-ability by inserting little Lego minifigures or other action figures as racers! It’s hard to believe that something so chic-looking is made from nothing more than wrapping paper and an empty toilet roll! Apartment Therapy shows you how you can keep your wires organized in a pretty manner, with a DIY that doesn’t take more than five minutes! The Pixar movie Inside Out dealt with different emotions, one of the earliest things we teach children to identify for effective communication. Meaningful Mama takes it a step further with very detailed Inside Out characters, representing all the emotions and made of – toilet roll tubes! With Halloween on the way, it’s time to stock up on monster crafts! 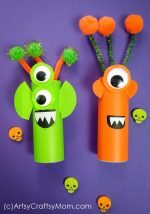 This one from Happy Hooligans is perfect for toddlers and preschoolers who can play with toilet rolls, paints, pipe cleaners and googly eyes to create their own personalized monsters! Now this is a craft that you’d love to hug! Crafts by Amanda shows you how to turn a very insignificant-looking toilet roll tube into an absolutely adorable polar bear that’ll make you want to spread the love! This one is grey, but you can try a white version too. We’ll have to wait for next year to enjoy spring, but that doesn’t mean that we can decorate our homes with the colors of this season! These colorful little butterflies from Bo Bunny are sure to brighten up a dull space, what with their floral wings and cute antennae. Go ahead and draw some smiles on them too! Have you ever tried making a circus performer out of a toilet roll tube? Yes, we didn’t think so! The Art Room Plant shows you some fun models you can make of circus performers, including a strong man and an acrobat. Pinatas take a regular party to another level, don’t they? For your next party, be sure to make this pull-down pinata garland from Love and Cupcakes. The pinatas are toilet rolls, wrapped in fringed-paper and filled with little treats – perfect for little kids! The minions are such simple, happy creatures that everyone loves – no wonder there are so many crafts based on them! This particular one from All Free Kids Crafts is made by covering toilet roll tubes in yellow and blue paper, and drawing in the details with Sharpies – so simple! Don’t be alarmed by the name; these little creatures are far from beastly! They’re actually cute little critters, with glittery wings and colorful legs. Red Ted Art gives us a lovely little critter craft that is perfect for the current weather and encourages some outdoor play! Spiders can be large, hairy creatures that can make anyone run screaming from the room. Or they can be like the ones at Molly Moo Crafts – colorful, fun and very interesting! The unique part is that you don’t use a toilet roll in its original cylindrical shape – you transform it. Click on the link to find out more! Just look at that bee – isn’t he such a smiley, sunshiny fellow? Just looking at him makes you want to smile and be nice to everyone! 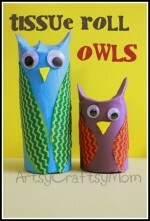 You can make one for yourself with an empty toilet roll, colored paper and instructions from Easy Peasy and Fun. The toys we make ourselves are often the most fun, aren’t they? For this ball and cup game from Hello, Wonderful, all you need are empty toilet paper rolls, yarn and some large wooden beads – yes that’s it! This is an easy craft for preschoolers to make and play with – enough to keep them occupied for a while! We’ve talked about Star Wars and Minions; can minecraft be far behind? Kids Activities Blog has a very impressive minecraft creeper craft for kids to make. The project is great for older kids, and there’s even a video tutorial to help! We’re all familiar with the story of Red Riding Hood and how she dealt with the wolf who swallowed her Grandma, but this craft from Red Ted Art makes it so much more real with cute little toilet roll characters! It’s a slightly time intensive project, but completely worth the effort – just look at that Grandma! With fall coming, you’re likely to soon have lots of golden brown leaves on hand. Be sure to collect them for this toilet roll turkey craft from Easy Peasy and Fun. Once you’ve got the leaves ready, the rest of the craft just involves a bit of sticking – it’ll be ready in a jiffy! Have you ever wondered how cool it would be to breathe fire like a dragon? Thanks to this craft from One Little Project, you can actually get to do it with a toilet roll and basic craft supplies! The craft is simple enough, but we can imagine the amount of fun you’re going to have blowing through the rolls! Summer’s on it’s way out, but that doesn’t have to stop you from making this adorable craft featuring some summer gals! Molly Moo has made toilet rolls look unbelievably pretty, as colored paper, a sharpie and some glitter come together to make a cute Hula girl and her mermaid BFF! The sheer versatility of toilet rolls is visible in this fun craft by Eighteen 25. Toilet rolls are painted, cut into spirals and then decorated from some really cool, swirly snakes – complete with a slithery tongue and protruding eyes! There’s something endearing about penguins, which probably explains why they’re pretty popular (Mr. Popper’s Penguins, Pingu, Happy Feet, Penguins of Madagascar). Krokotak dips into this penguin fandom with their toilet roll penguin craft that’s actually a lot easier than it looks! Here’s a craft that’s perfect for the 4th of July or Patriot’s Day. 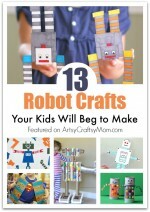 Let kids make their own statues – the craft offers some good cutting and sticking practice! One tip – use some orange and yellow crepe paper for a more realistic ‘flame’. Okay, that’s a lot of empty toilet rolls! 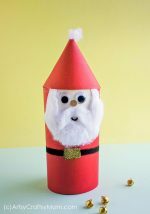 Remember, you can also get cardboard rolls from foil or cling wrap rolls, so save them all up for a rainy day and you won’t need much else to make these super cute paper roll crafts!